Keep toasty this Autumn/Winter with our super selection of cashmere beanies and pom pom hats. 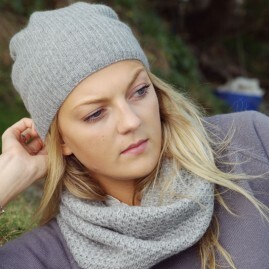 Shown: Cashmere textured snood and Cashmere unisex ribbed hat/beanie in light grey. Cashmere round neck boxy jumper in Rothko.